Creativity is very important to be a designer, but if you want to be a successful designer then you need to be successful in every single way like being innovative and understanding the market. A salutatorian graduate of the Pakistan School of Fashion Design (class of 2000), Yasin is affiliated with the La Chambre Syndicale De La Couture Parisienne in France. He holds an honours degree in couture and currently serves as a member of the board of directors and the executive committee of the fashion institution he graduated from. Starting as a fashion choreographer in 1994, Yasin worked both as a choreographer and designer in various shows within Pakistan and international shows including Dubai, London, New York City, and Toronto. The year 2000 marked the introduction of Yasin's own fashion label, HSY. Starting as a bridal and formal wear couture house, it has since become one of the most recognized South Asian fashion labels in the world and currently employs over 350 people and six stores internationally, with the flagship studio housed in Lahore. 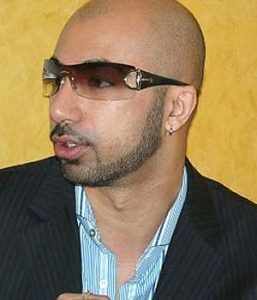 In 2003, Karachi-based Diva Magazine placed Yasin on the cover of their "Most Powerful People" issue and also as one of their 10 Faces of the Year. In 2007, Yasin introduced a jewellery line under the HSY brand. “In 1994 I started my career as a fashion choreographer, during the14 years that followed I did a lot of local shows; I traveled a lot and did a lot of international shows. During that time I decided not to throw away my career and become someone conventional. When I was 5 yrs old I developed an urge to design my own cloth. In 1996, I joined the Pakistan School of Fashion Design (PSFD) and graduated in 2000, I learnt how clothes are put together, the philosophy behind them that led to the opening of my fashion house HSY in. The government of Pakistan has just appointed me in the Board of Directors of the school as well and in the Executive Committee. HSY is the winner of Lux style Fashion designer of the year award 2005-6. The design philosophy at HSY is to combine contemporary silhouettes with traditional techniques of old, making it appealing to an international clientele who have an appreciation for the grandeur and extravagance of a regal past but expect further innovation and creativity. I believe every single designer has a different role when viewing fashion. At HSY we always feel that if fashion portrays a slot of crazy hurricane competed with the sensationalism of fashion trends then we want HSY to be the eye of the storm, where we are, it's the center of timeless classic couture you can wear now and maybe you can take out 20 years later and it will still be relevant. We don't believe in trends-of-fashion; we want it to be something timeless, classic and elegant. HSY label speaks about the modern day woman who understands the rich legacy of the past. The lines are fluid and silhouette is full and luxurious. Using only the purest of fabrics and richness of embroideries, the emphasis is on unconditional glamour. Yes, I like to do what I enjoy and I feel that fashion is not just about clothes, it's a lifestyle. And I want HSY to be a lifestyle product I want people to be able to buy into the lifestyle that HSY represents, something for everyone. 5. When did you start menwear clothing? I always wanted to do menswear but wanted to progress slowly and gradually with complete concentration and produce something exciting and fabulous. Now that we have the time and we feel that we have established HSY women's wear so now we can start off the HSY men's wear. Can't start off anything I can't concentrate on, seriously, it's about trying your hand in everything and that's what we are doing right now. Yes, off course why not. Prices are very low. You need so many skills that are unbelievable and I think it's true for so many professions. Besides obviously having a good aesthetic sense and the ability to be creative you need to be able to explore the world explore yourself and explore all the things around you because fashion is about constant reinvention with a philosophy underlined. You should also travel and meet people, understand cultures and socio-economical limitations. If you know all this I'm sure you can put up a store in Lahore and sell. Creativity is very important to be a designer, but if you want to be a successful designer then you need to be successful in every single way like being innovative and understanding the market. I mean I can come up with a great idea for a bikini and put it out in Peshawar who's going to buy it? It has to be relevant you have to be relevant in your advertisement. The inspiration behind the collection is the spiritual beauty of the East, celebrating our affluent time honored heritage with an emphasis on the use of cuts, both ageless and contemporary, to craft a look that is elegantly classic. 11. In the recent years, a lot of new designers are coming. Do you think it will saturate the market or isit a good sign for fashion industry? I wish I had any spare time. I never do. It's always crazy and rush from project to project, we just launched HSY jewellery and are planning to launch HSY home furniture line and accessories so that's going to drive me even more crazy. “Go to school, there are no shortcuts. Educate yourself. Learn about fashion, the construction of clothes; understand who a designer really is. Go through the whole process of education if it doesn't work out then there are a lot of different fields related to fashion industry like production, management or retail”. D&G watch from New York. “Vaneeza Ahmed for her explicit method of bringing life to my lines, you put an outfit on her and it will look as if it was just made it for her. Iman Ali is also my top favorite”. 20. Favorite make artist for your shoots? 22. Which city of the world is the best for fashion industry and why?